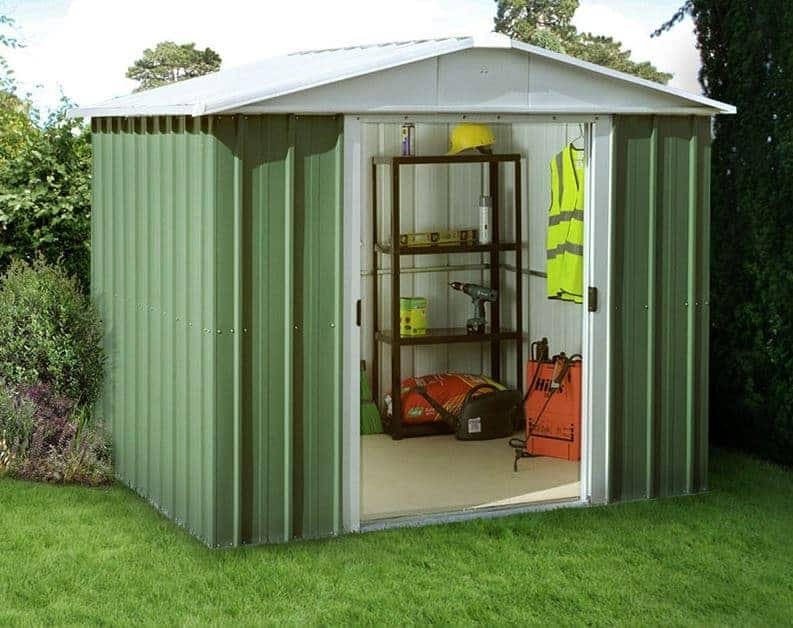 With its green metal body with cream details this is an attractive looking shed, and could convert people who’ve previously only had wooden sheds. They’ll be impressed with what they find, not least in the fact that they won’t have to carry out any treatments on the shed, yet it’s still covered by a 12 year manufacturer’s warranty. The warranty shows how resistant the shed is to rust, which is very important in the climate we live in. 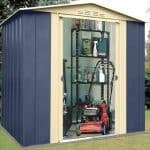 There are several factors which aid this shed’s weather defences, starting with the apex roof and going down to the rust free screws. The main body of the shed is made up of hot dipped galvanised metal, and is painted both inside and out. This makes it very difficult for rain to get inside, giving added protection to the contents that you’re storing. This is quite a large shed, even though it suffers from reduced headroom, so there are a lot of components. It’s designed to be self-assembled but it can take time unless the installation process is worked through methodically. We liked the fact that the anchor kit was included at no extra cost, meaning that as long as you already have a suitably flat concrete base no further purchase is necessary. 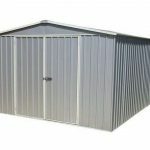 This mid to large sized metal storage shed combines the benefits and durability of metal with the pleasingly traditional look associated with wooden sheds. The paintwork was of the same high standard inside and out, with no bumps or ripples. It withstood handling, and should give an extra layer of protection to the cladding below. 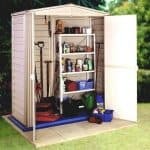 One area in which the shed could perform better is in its height. This is helped slightly by the rain repelling apex roof which gives a ridge height of 1.93m, which in itself isn’t too bad. There’s a significant drop to the eaves height, however, which is 1.63m. We really noticed this when within the shed, so taller people will really have to stoop when walking about the interior. The overall width of the shed is 2.42m and the overall depth is 2.17m, although the minimum base size required is 2.26 X 2.07m. 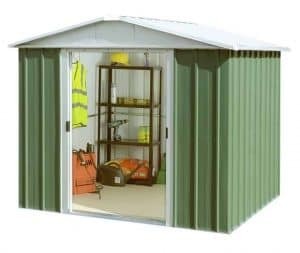 When reviewing metal sheds, we are keen to see that the cladding, once fully assembled, is tough enough to withstand the strong wind and rain that our weather system often produces. For a lightweight shed, this passes the test. The cladding seems much stronger once it has been pieced together and attached to the slightly thicker and more robust frame. This is in part due to the zinc plating that is added during the galvanisation process that all of this shed’s cladding goes through. We sometimes find that metal sheds, especially highly affordable ones such as this, come without an anchor kit, placing an emphasis on the consumer to source and purchase one. That’s why we were pleased to see that the anchor kit came as standard here, and especially that all the screws were made of rust resistant stainless steel. It’s a little touch, but a welcome one. Yardmaster provide a 12 year warranty with this shed, effectively guaranteeing that there won’t be perforations in that time that have resulted from rust as opposed to impact damage. 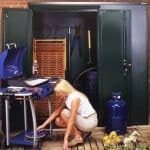 Whilst we have seen sheds offering warranties that are even longer than this, we feel that this is an adequate length of cover for a shed of this price, especially as some metal sheds are only covered for 10 years. There are, of course, no treatments that are required during this warranty period, other than routine cleaning. The wide frontage of this shed was enhanced by the sliding double doors, which at 1.01m are considerably wider than many double doors we see on metal sheds. Yardmaster put the sliding mechanism inside of the shed itself, which is a feature we like as it makes the doors more secure and robust. The height of the doors is necessarily restricted by the low eaves, so their height of 1.58m really meant that we had to bend down when walking in and out; this is a pity when there’s so much space to move around in inside. There are no windows in this shed, so you may want to have a torch handily positioned near the entranceway. With security increasingly important and opportune shed crime on the rise, we would have liked to see a padlock included as standard. Unfortunately that’s not the case, although the handles are holed to accept one, and a good quality padlock and alarm system can be purchased inexpensively. If one is purchased, the interior doors and lack of windows would make this a secure storage facility for the garden. The width and depth of this shed provide a lot of floor space for storage purposes, but to make the most of its full potential shelving is needed. That’s why we were pleased to see that a strong standalone shelving unit is available as an optional extra. Featuring four resin coated shelves, its measurements of 2’6 X 1’8 make it an ideal choice for placing smaller tools, such as trowels, on. Another space maximising optional extra is the Tool-Plus tool rack with wheels, which is also a boon when it comes to organisation and tidiness. We could tell that this shed was going to be of high quality from inspecting the paintwork, always a good indicator. Attention has even been paid to the little parts, such as the rust free screws. Hot dipped galvanised steel topped by paint is a good combination when it comes to preventing rust occurrence, so it seems likely that this shed will provide more than 12 years’ rust free performance. The base dimensions of this shed are generous, and we liked how wide the double doors were that gave access to the interior. We were not as impressed by the low door and eaves height, so be careful when using the doors if you’re tall. We have a lot of experience in erecting metal sheds, yet have to admit that this isn’t the easiest to install. The instructions are picture heavy and not altogether clear. It took two of us around six hours to assemble it, but be prepared for it to take longer and to have to use a bit of trial and error. 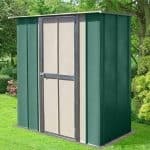 If this shed was taller than it would offer superb value for money, but even so we think that it’s well worth this money for a reasonably sized and well built garden storage solution. 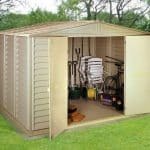 Final Thoughts: We were surprised at how tough and sturdy this shed was once we had assembled it, so if you live in an area that is often subject to strong winds and prolonged rain this shed should certainly be worth your consideration. With the addition of a shelving unit or two and a reliable padlock this can be a very useful storage unit that will keep the contents safe and secure from opportune criminals who target thieves. The window free design is a useful feature, and we liked the look of the painted corrugated style cladding on the walls and the roof.